A new philosophy and approach to weed control nowadays doesn’t call for toxic fertilizers, harsh chemicals, or even gas hungry equipment. It’s a goat-getting solution that is an eco-friendly marriage between modern day urban planning and traditional farming. 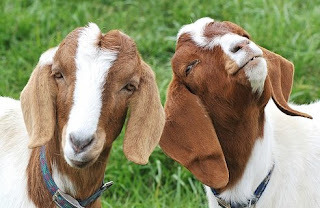 The idea that was adopted last September by the Los Angeles Community Redevelopment Agency involved having goats clean up (more like eat up) the downtown grassy areas. Basically, a herder drives in roughly 100 goats that munch away at weeds and grass along the streets. The goats clear away vegetation in hard to reach areas and graze on any leftover seeds that the pesticides and general mowing leave behind. A typical border collie is sometimes on sight helping to move, motivate and keep the goats in line as they feed on their afternoon lunch. Many citizens and city workers have complimented that the effort is uplifting, joyful and that the goats are much more cute to look at than heavy equipment and gas-powered weed wackers. From a cost perspective, the agency has shared that the goats were being rented for $3,000. The cost of hiring workmen to clear the 2 1/2 -acre hillside would have totaled as much as $7,500. Who is David De Rothschild?